We wrote recently about the Advance Arkansas Institute’s work advising legislators on how to bring tax reform and relief to Arkansas. You can check out AAI’s latest work on that topic at at advancearkansas.org. In addition to this work, AAI’s president is also advocating for the passage of pro-growth tax reform at the federal level in 2017. AAI’s Dan Greenberg was one of 88 signatories of a letter sent to White House and Congressional leaders urging that tax reform be signed into law this year. In the past 30 years, the tax code has expanded in size and complexity. Today, the code serves well-connected special interests, not hard working American families. After many years of inaction, Congress and the administration have a chance to fix our broken tax system this year by making it fairer, simpler, and less burdensome. There is broad consensus on the need for tax reform. With the 2018 midterm elections in sight, it is also crucial that bold policies keeping the promises made to the American people are realized soon. Numerous polls have shown widespread public support for tax reform that lowers rates for all and reforms the code based on the principles of simplicity, fairness, and equity. Americans are frustrated with the rigged system that favors the politically connected and lobbyists at the expense of ordinary Americans. It is key that tax reform reduce rates for Americans across the board, drastically simplifies the code for families and individuals, ends the Death Tax, unrigs the system to promote a healthy economy, and implements a territorial system of taxation so businesses large and small can compete. President Donald Trump has said that accomplishing tax reform is one of his policy goals for this year. He’s repeatedly said that this would allow the United States to become more economically competitive in the fight to retain and attract jobs and businesses. 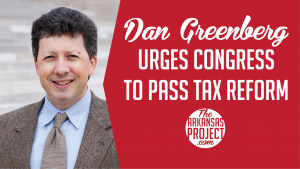 Also, all four members of Arkansas’s House delegation stated last month that they support reforming the nation’s tax code. If tax reform happens, it would be one of the greatest conservative policy achievements in decades. You can read the full letter sent today here.